I wanted detailed mapping, but the Edge 1000 is just too damn big for me to be comfortable with it while mountain biking. I also wanted GPS+GLONASS for accuracy purposes. I’ve been seeing tracks from people using Edge 520’s and 1000’s in places I’ve ridden and had poor results, and the tracks on the newer models are bang-on accurate. I decided to purchase an Edge 520 because visual maps have been fine for me in the past. I’ve never really trusted bike GPSes to navigate me anywhere on their own. I’ve started programming Courses into my old Forerunner 310XT and it’s been passable. But with no reference except what I’ve already ridden, it’s a little limiting. The Edge 520 offers improvements in all those areas. And on the bike, I prefer physical buttons, since they’re less likely to be bumped, especially on the mountain bike. I’ve had the Edge 520 for a couple weeks. Most of my rides with it have been 2-4mi commute rides. Simple to track, navigation is unnecessary. Today I had my first long road ride with it. I won’t get any mtb rides with it for a week or two, as I’ve got a century ride coming up in less than a week. I’ll add mtb ride impressions after I manage a couple of those. Some friends of mine planned out a Memorial Day ride that would go around the circumference of the I-465 loop, which was renamed the USS Indianapolis Memorial Highway. Since we can’t ride our bikes legally on the interstate, we did a loop that stayed pretty close to it around the whole city. It’s just a hair over 85mi. This would be a perfect ride to use the Edge’s Course navigation along with a map. I loaded topo maps on the Edge 520. Since I can’t navigate on roads, I wanted as much map data as possible without swapping maps all the time. I used topo maps from gpsfiledepot.com and loaded them more or less according to the procedures described here and here. Loading topos from gpsfiledepot.com onto the Edge 520 has a couple of quirks. So you download the maps you want from gpsfiledepot, which requires you to install them and then access them through Garmin’s software. Either Mapsource or Basecamp. Surprise, neither program recognizes the Edge 520 as a possible location to save maps. Nor do Mapsource or Basecamp permit you to save maps onto your computer’s hard drive. I figured out quite by accident that the programs DO permit you to save maps onto memory cards. So in order to use these maps, you have to have a memory card inserted into a card reader. I did not test it with a USB thumb drive. That may or may not work. Once you manage to save the maps you want, pick up in the posted procedures with taking the saved gmapsupp.img file, renaming it to gmapbmap.img, backing up to gmapbmap.img file on the Edge 520, and then replacing that file with your new maps. So I installed topo maps as well as the Course I wanted to ride onto my Edge 520. 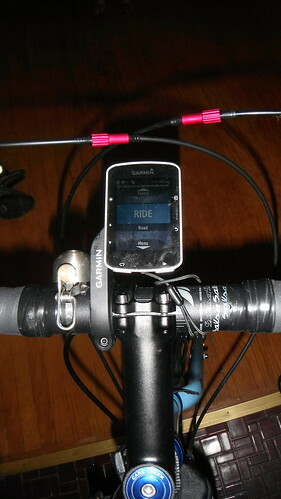 I have my Edge set up with a Garmin magnetless hub sensor on the rear wheel, a Bryton cadence sensor, and a Bryton HRM (both of these came with the Rider 310 and have worked very well). This was the actual ride. I was dead accurate with following the Course. Other folks on the ride had problems with not getting warnings of turns until they were in the middle of them. The Edge 520 pretty much gave me notice at least 500ft away and sometimes well over a mile ahead of time. Part of that variability, I think, was related to the way the route was created in RideWithGPS. The people having trouble with getting adequate warning had older Garmins, and I have to wonder about the settings they used for Courses. At any rate, the Edge 520 navigated the long Course like a champ. I will be using this GPS on a century ride this coming weekend, also. For that ride, no digital maps will be available. Navigation will be done the old-fashioned way, with paint on the roads. The Edge 520 will serve duty recording, and I will also load area maps so I have a visual reference for the area. I’ll post mountain biking results after I use this GPS on a few mountain bike rides. I might well do a short and easy recovery ride tomorrow to stretch the legs out. After a few mtb rides, I’m pretty pleased with how this Garmin performs in wooded, twisty trails. Quality improvements are subtle, to be completely honest. But comparing to previous tracks that used different receivers, the differences become apparent. Here’s a rough comparison of my three main devices on the same trail. Different days, so it’s hardly scientific. Click the thumbnail to expand. The yellow track is the Garmin Forerunner 310XT. Compared to the other tracks, it’s messy. It’s all over the place. Now look at the red and blue tracks. Those are a little closer together. The red one is the Bryton Rider 310. It’s not bad for a budget receiver. Pretty close together on the uphill and downhill legs of the trail. Much less erratic. The blue one is the Garmin Edge 520. It’s just a touch tighter than the Bryton. More importantly, I think, is the smoothness of the track. The Edge 520 track is super smooth, and I think better reflects the smooth and flowy nature of the trail. I think the Bryton could be a fantastic receiver for the price if Bryton could address some of the quirks and oddities it has. Namely, the odd auto-lap screen that reports the same distance all the time, the ability to more quickly change bike profiles, whatever it is that causes Strava to ignore all wheel sensor data, and whatever it is that causes RideWithGPS to completely screw up all distance measurements from the device altogether. I am tempted to do a factory reset on the Bryton to see what happens with it then. As it is now, I’m super pleased with the Edge 520. Strava doesn’t throw out wheel sensor measurements, thank goodness. RideWithGPS reports distances correctly. Switching ride profiles is super quick and easy. I’ve only used the Bluetooth connectivity once to set up weather alerts. None came through while I was out on the road, but nothing made me think I should have received one that didn’t arrive. I tend to leave Bluetooth off otherwise, because I don’t tend to use the features it offers and I like having some extra battery life. I’m also pleased that Garmin returned to physical buttons for this device. A few functions require more button pushes than a touch screen would, but I’m far less likely to mistakenly press a button than to mistakenly activate the touch screen. I recently lost my Garmin Oregon 450t. I would mostly use it to follow a gpx track that I had downloaded from Strava or the internet. I would mount the unit on my handlebar and use the compass view to follow the compass arrow along the track. I think I can get away with the etrex 20x for that function. Any reason to to get the Edge instead? It really depends on your end use. Generally speaking, handhelds are a little more versatile if you’re primarily doing backcountry travel at a low intensity level. The way they route/navigate is a bit different from the Edge models, though. On the Edge models, that difference is pretty important when you’re doing high intensity efforts and you want a little more feedback from the device. An Edge can use a routing format that Garmin calls “Courses” which allow you to to build them with a bit more depth and insert prompts so the device will beep and show a popup with a little text. Particularly for things like turn notifications. But you can also add custom ones like campsites, water refill areas, food/water caches, etc. that are not focused on a race type situation. There are drawbacks, though. The Edge series devices are a bit more touchy with whether you’re “On Course” or not, so for mtb use, I find that the device gets a little upset if where it thinks you are doesn’t match exactly with where it thinks the trail is supposed to be. It still works, and you can change settings a bit to limit the impact of annoying notifications, but it reduces the utility somewhat. Personally, I prefer that functionality for road riding. For MTB use, I’d rather my route appear as an overlay on my basemap so I can just do quick visual checks. The only exception might be for a long race, where course markings might be limited or nonexistent. I am currently using the 510 model but i have been recently eyeing this one on amazon and may have to make a purchase soon. This certainly looks like the superior model. I feel like it is, even if only for the fact that it has physical buttons. But the Edge 520’s limited mapping capability puts it way over for me. Heloo.I’m hoping you can assist me with garmin 520 . Can I connect garmin 520 to the android phone using the usb otg and put gmapbmap.img ?I travel a tour around 3000-4000 km and I plan to make smaller maps and use it when needed.﻿Thanks. That’s not something I’ve ever tried with mine, so I’m not entirely sure. Seems to me that would be more dependent on the phone than on the Garmin. My phone supports usb otg .I can use the usb stick as an external memory.Can the Garmin 520 be seen as a usb? Instead of the route I would use to move the map to the phone.On my trip I do not have a pc. I do not like 820 because of the touch screen and 520 does not have enough memory. For the past 10 years I have used the phone on my tour. I’m interested in bryton 530.Can the 520 follow the route if there is no map like bryton 530? I just need to follow the route. So pretty much any Garmin will appear as a USB drive on a computer. I don’t know specifically if that also applies to Android phones or not. If your phone will work as a USB host, I don’t see why not. The Edge 520 can follow a route if you have no maps. You just need the route programmed in as a “Course”. I like to program Courses in RideWithGPS for this purpose. It works exceptionally well for following a route on roads. It sorta works on mtb trails, but there are a lot of caveats to that. It depends on the quality of the data you use to base your course upon. If there’s poor data or no data for the trail(s) you wish to use, then it can be problematic. Same for roads, I suppose, but it’s easier in most cases to use a satellite image for a road than it is to do the same for twisty, narrow trails.